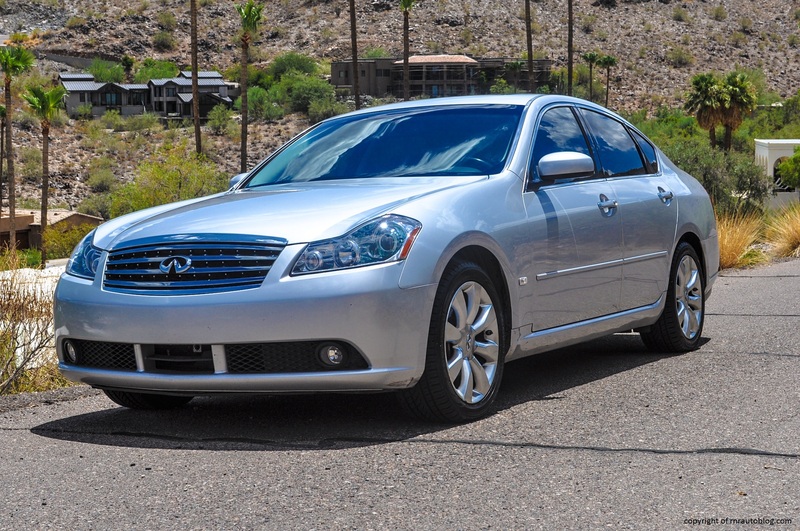 For the longest time I could remember, the third generation Infiniti M has always been my favorite luxury sedan. Funny thing is, I have never actually driven one. Its sporty looks and the fact that it was based off the same platform as the Nissan Z sports car gave it performance credibility. 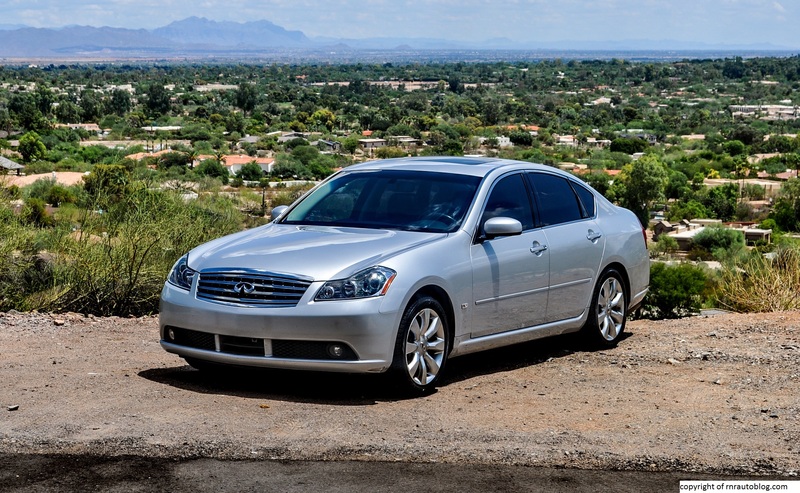 This generation was a Consumer Reports Top Pick, and it was well received by the press. The strange thing is that the M wasn’t always a luxury sedan. Rather, it was a two door in either a coupe or convertible configuration. 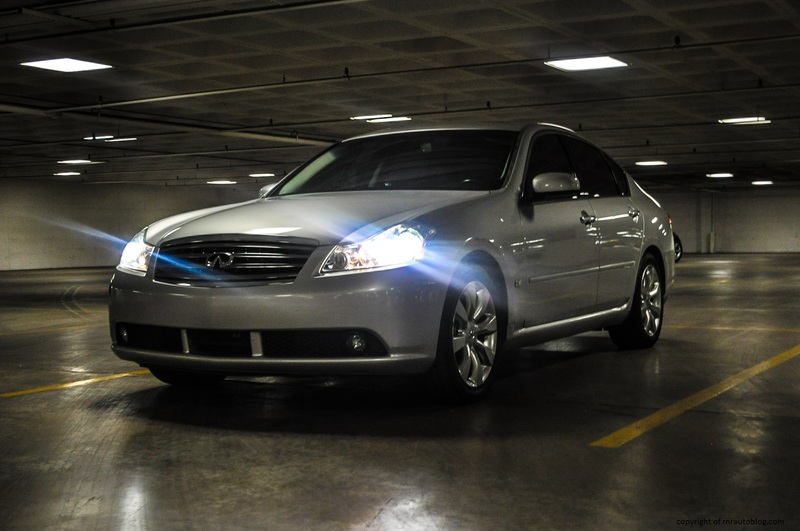 In 1989, Nissan introduced its luxury division, Infiniti, to take on the Germans. As one of the first two models to be produced by Infiniti, the 1989 M30 Coupe and Convertible were a rebadged Nissan Leopard. Alas, it lasted only three years in production. According to Wikipedia, it is rumored that less than 12,000 M30s have been sold, making it the rarest Infiniti ever made. 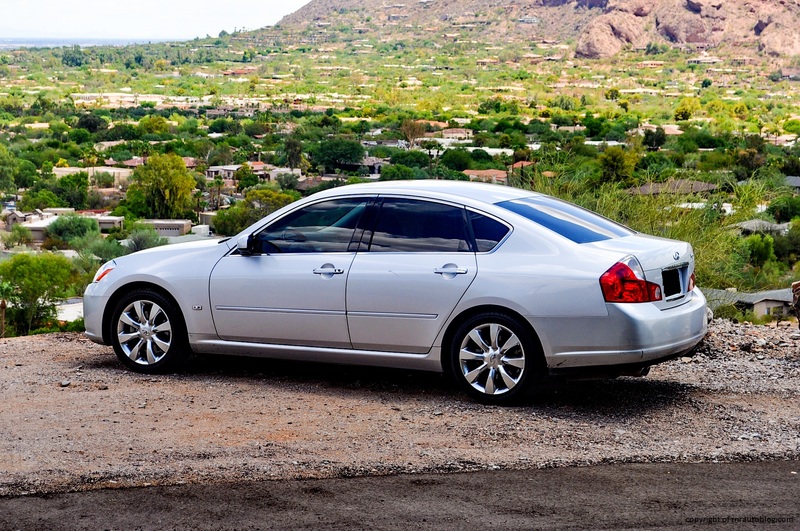 It was not until 2002 that the M was revived as a rebadged Nissan Gloria, this time as a luxury sedan. My friend Madison’s father had a silver M45 when I was little, and I remember being fascinated with it. The second generation M was long and narrow, and this gave it a futuristic appearance. The fact that it was powered by a 340 horsepower V8 which was a a lot back then added to its appeal. Sadly, due to its high price and unremarkable handling, it trailed the BMW 5 Series and the Mercedes-Benz E-Class. Sales were so low that this generation only lasted for two years. 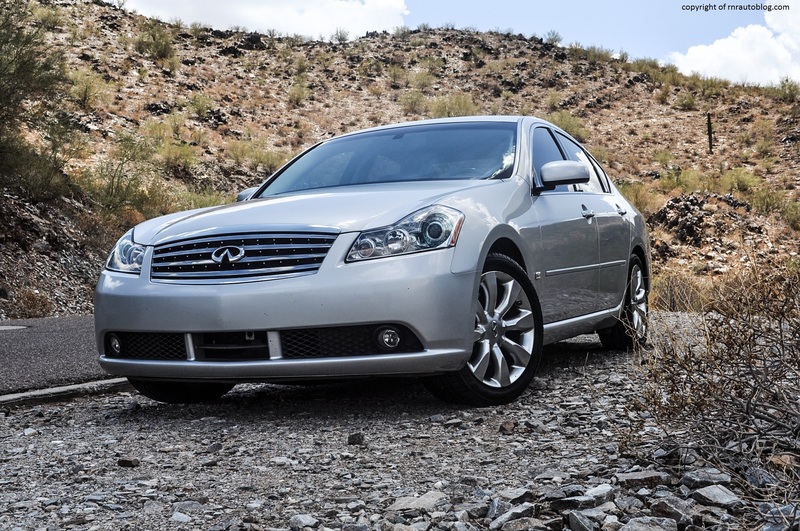 This time, Infiniti wasn’t taking any chances. 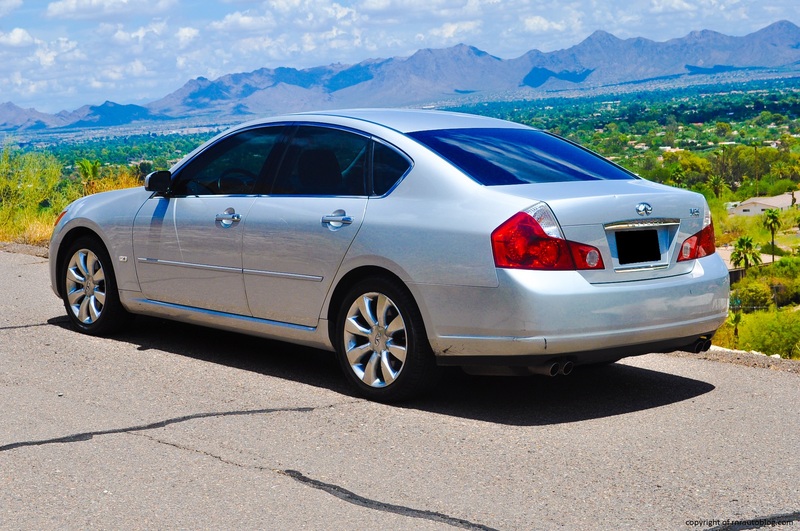 In 2006, it debuted an all new and redesigned M, again another rebadged Nissan sold as the Nissan Fuga in Japan. 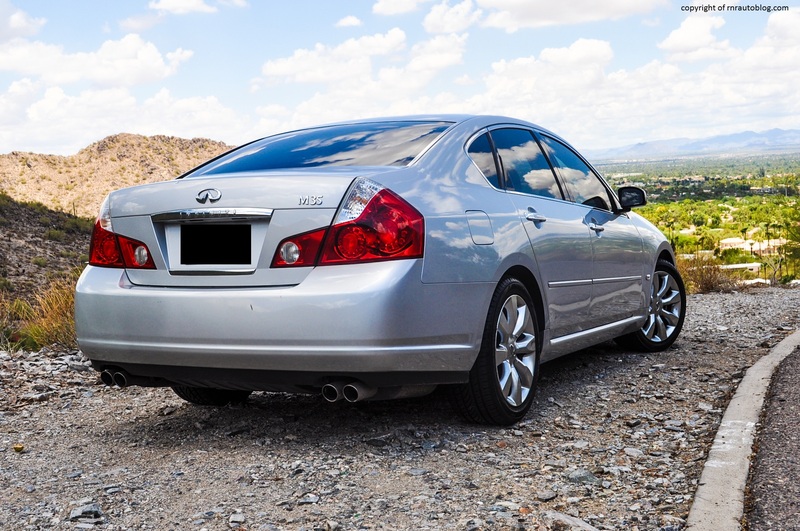 This time, the Infiniti M was based off the “FM” (front-midship which basically means the engine is pushed behind the front axle for better weight distribution) platform that underpinned the Nissan Z sports car as well as the sporty Infiniti FX SUV and G sedan. In addition to having a chassis derived from a sports car, the M also was powered by Nissan’s well-received “VQ-series” engines. I was both nervous and excited to review this car to see if it really did live up to my expectations. Despite looking more conventional, the third generation M retains the futuristic appeal of the second generation. There is a certain Japanese quality to the exterior. I feel like Infinitis always have had that Terminator essence. 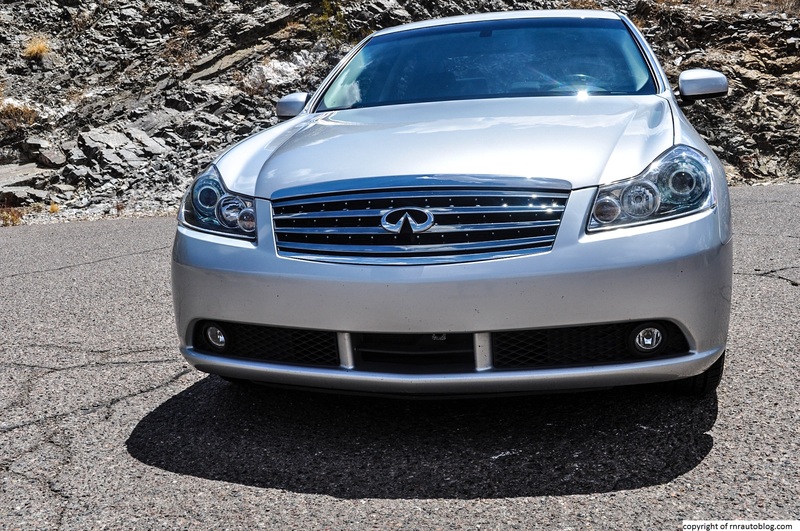 The front has an aggressive stance to it with sharp headlights and the chrome grille. The hood is nicely contoured, and I like that it has lines that lead your attention to the headlights. Aside from the fashionable wheel design, the side profile isn’t anything special, but the rear is probably the most Japanese aspect of the design. For starters, the taillights are very distinctive. For some reason, they conjure images of lobsters…I don’t know why. The quad exhausts hint at this car’s sporting pretensions. In the interior, the wood trim and the analogue clock lend opulence to the interior as do the smart looking buttons. The exterior is a perfect combination of simplicity and trendy cues. I like how it is not over the top yet it looks unique. From behind the wheel, it is apparent that this sedan is based off a sports car. My goodness, the M is a joy to drive. The steering’s light weight at low speeds aids parking, and it firms up naturally as speeds rise. It weights up more in turns, and the steering provides decent feedback but what impresses me is how quick the steering is. Even though this is a fairly large car, its agility belies its size. 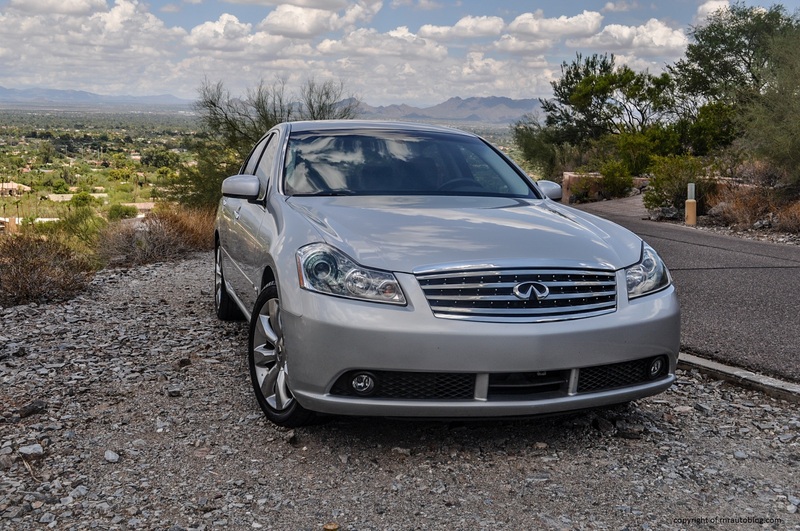 Its turn in is crisp, and when pushed to its limits, the Infiniti is very responsive. The excellent tire grip and the spot on weight distribution means that its handling borders on sports car territory. With stability control off, the rear end will slide, but when it does, it is progressive and controllable. It stays firmly planted on the road, and I could not stop smiling when driving this thing in curvy roads. The stiff chassis makes for a taut suspension which pays dividends when turning on poor surfaces. However, it is because of the stiff chassis that it doesn’t measure up to a Mercedes-Benz E-class in terms of ride comfort. 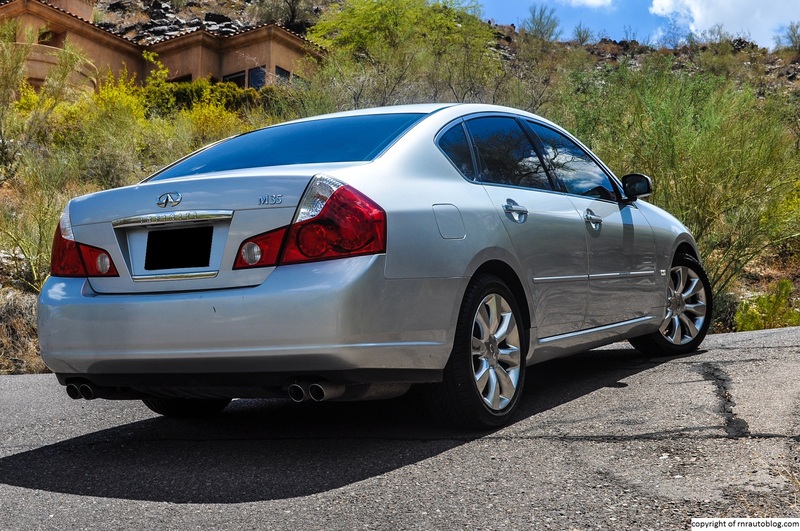 Usually, I wouldn’t mind some firmness in say a Nissan Altima, but in a car costing upwards of 45 grand, I do have to admit that the ride quality is too jittery for the price. The brakes provide superb performance with short stopping distances and a responsive brake pedal. 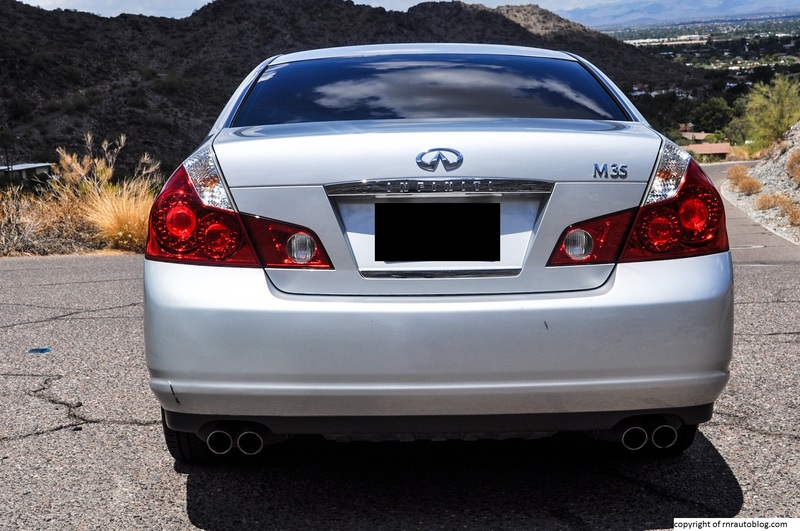 When it launched in 2006, the M was available in two guises: M35 or M45 (if it had AWD, then it was M35X or M45X). 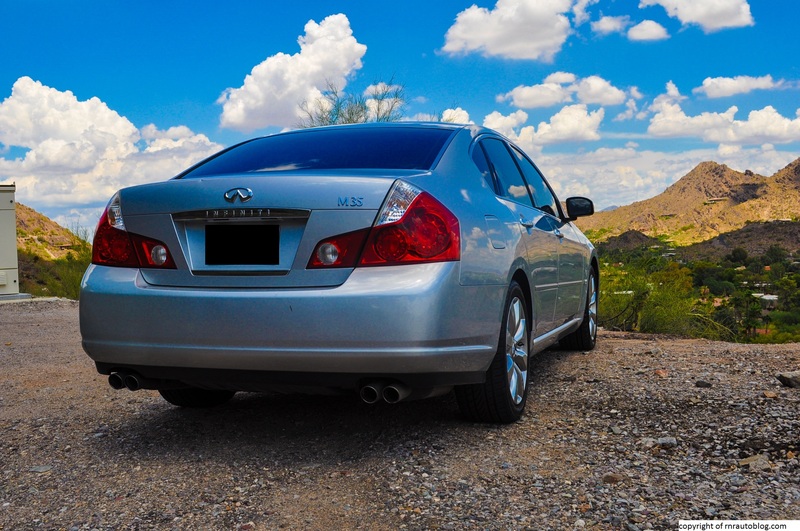 This M35 here comes with Nissan’s highly publicized “VQ” series V6. I say highly publicized because this engine has received numerous awards for its blend of power and flexibility, and not only that, this engine is popular in the tuner subculture for its tuning potential. 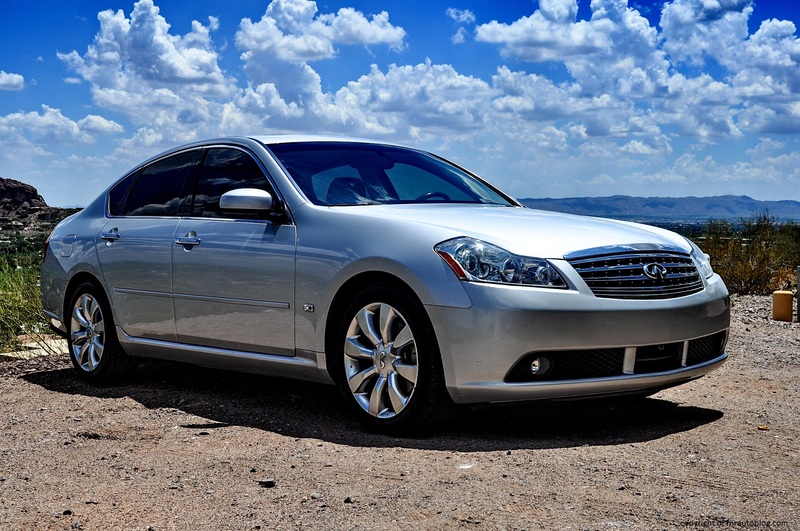 With 280 horsepower, this 3.5 liter V6 feels stronger than most V8s in competing luxury sedans. As soon as you touch the gas, there is a noticeable shove. Acceleration is that effortless. I have no complaints about this engine because it feels brawny at all revs, and it hustles this sedan with authority. 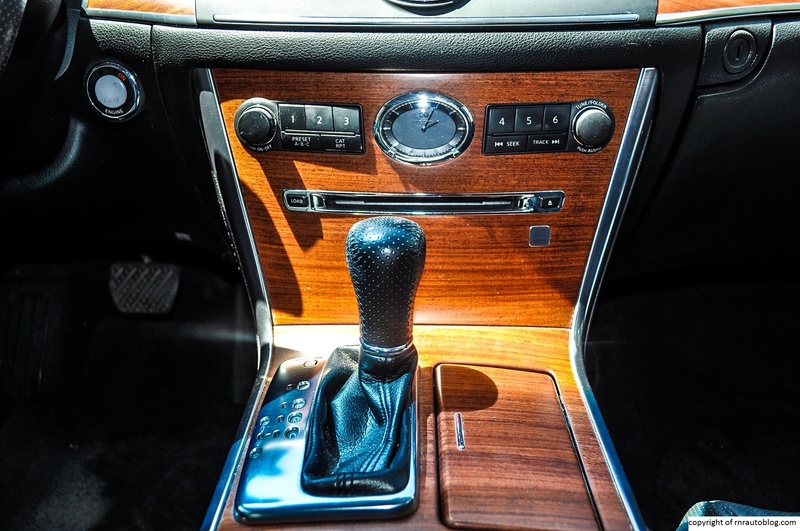 However, the five speed automatic transmission blunts its performance a bit. It hesitates and hangs on to revs too long, and shifts are not the smoothest. I got so fed up with the transmission that I ended up using the manumatic function half of the time I was driving, which by the way works well as it gives you complete control with no computer involvement. 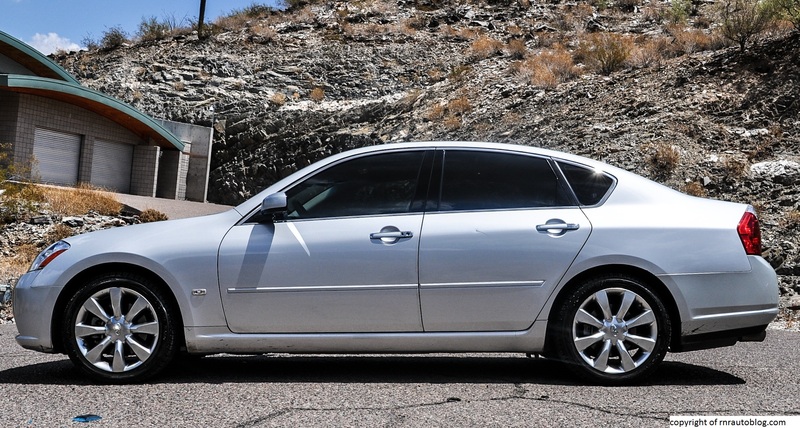 For those who want more power, there was a M45 version with a 325 horsepower 4.5 liter V8 engine. Aside from the ride quality, I can see another reason why people would forgo the M in favor of its German competitors. 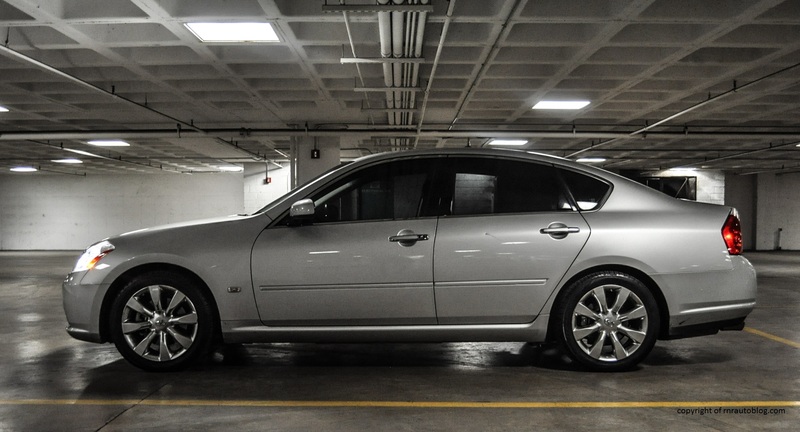 The refinement is a demerit; it is just simply too noisy for a car of this price. 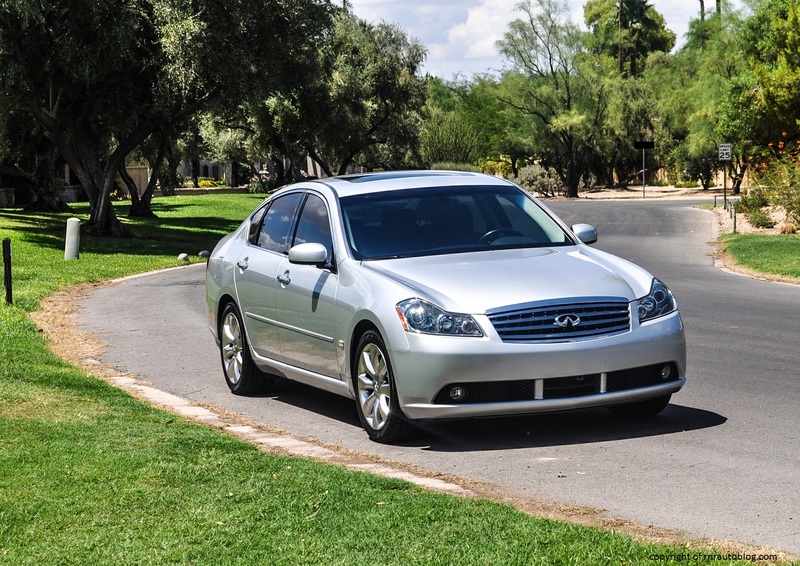 While highly praised, the VQ V6 is not without flaws. It grumbles at speed, and while it sounds decent when pressed, it doesn’t sound as cultured as you would expect from a luxury sedan. There is some noticeable suspension thud, and some wind noise is present. In the cabin, it is apparent that this car has roots that can be traced back to Nissans. While upscale, the interior has a cheap feeling dash, and some materials do not feel as solidly constructed as they should. The leather seats feature acceptable bolstering to keep you from sliding about in corners, and they also provide superb comfort as well as decent lumbar support. 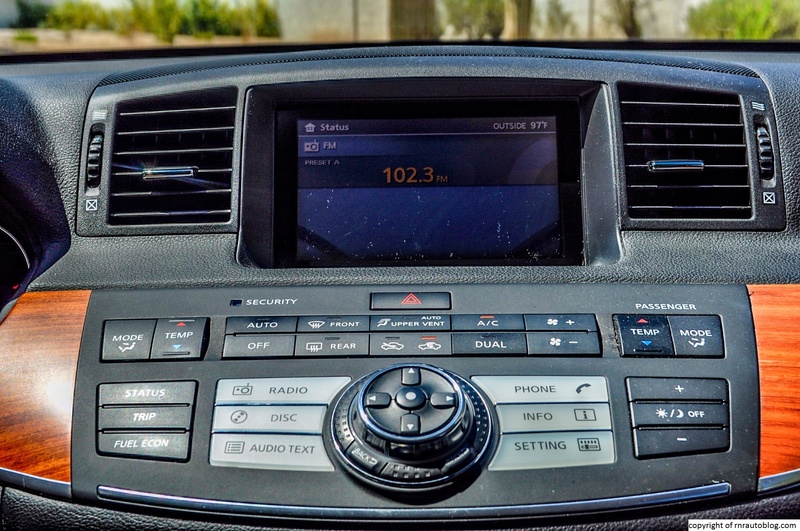 The navigation system can be controlled via touchscreen interface, buttons, or a rotary controller. Initially, I found the whole setup confusing, but after a few minutes, the controls are easy to understand. The climate controls are a far reach from the driver, and because they are placed sloping horizontally instead of vertically, they are hard to read at first glance. The rotary controller works very well, and it proved to be less distracting on the move than I thought. The navigation system works well, but my main complaint with this system is that it is literally unreadable in direct sunlight, and it is recessed further than I would like. The gauges are logically laid out, and cabin storage is adequate. 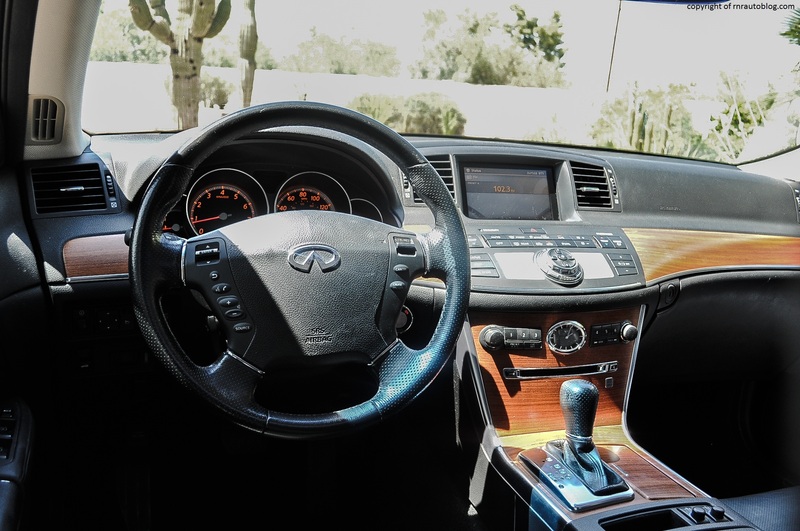 It is very easy to find a driving position that suits your preferences. 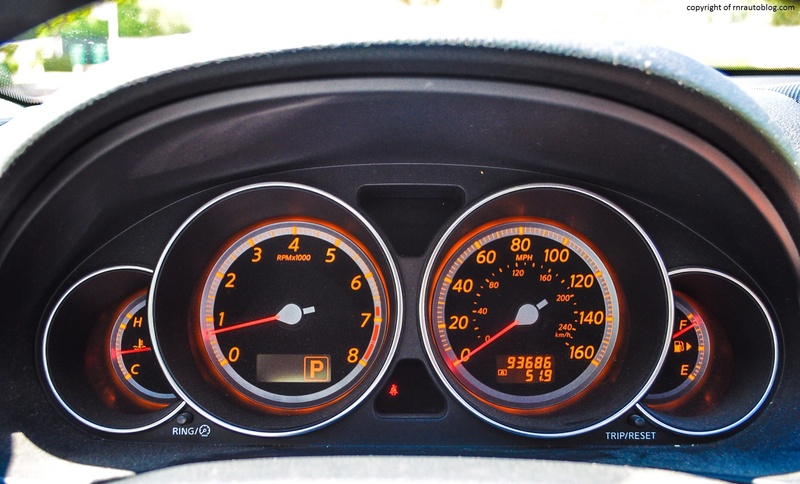 I say very easy because when you adjust the telescoping and tilt steering wheel, the whole instrument cluster (gauges) moves with the steering column. Visibility is good out front, although the rear is not the best. 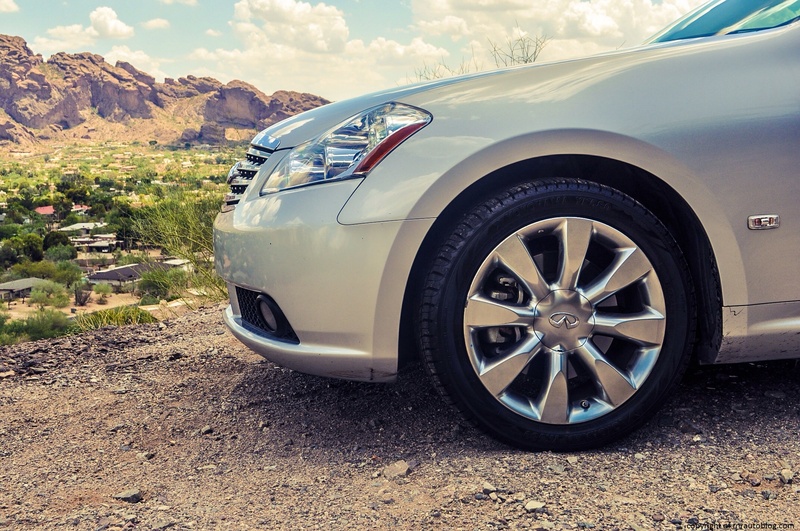 With plentiful headroom and legroom, there is space to spare in both the front and back, and the usable trunk space should cement this car’s appeal as a family car. 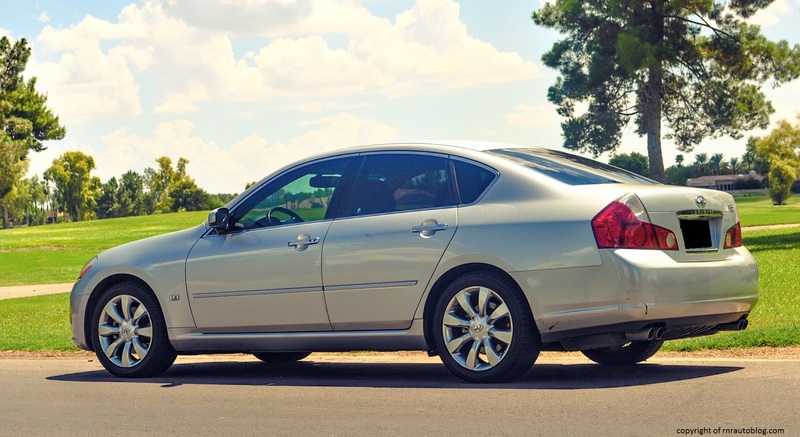 Ever since this M debuted in 2006, I have read consistently good reviews about this car. 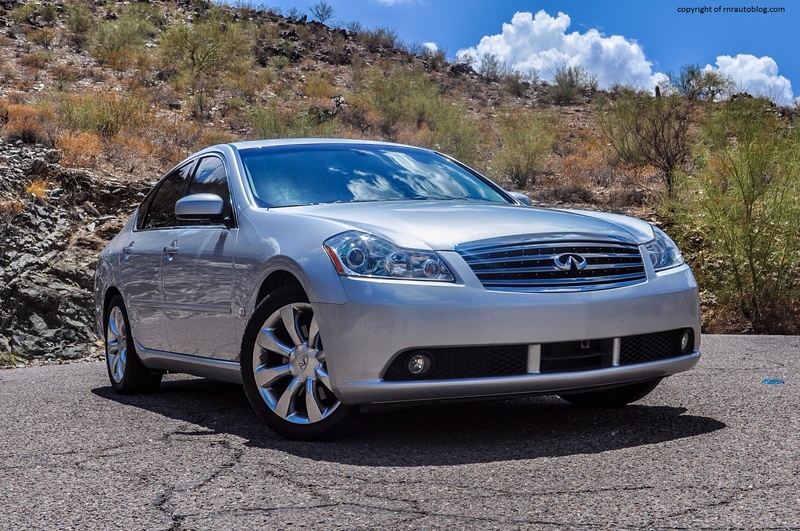 I even recommended a 2011 Infiniti M35X to my uncle (which by the way, he loves it), and I was adamnant that if I was ever in the market for a luxury sedan, this would be my choice. 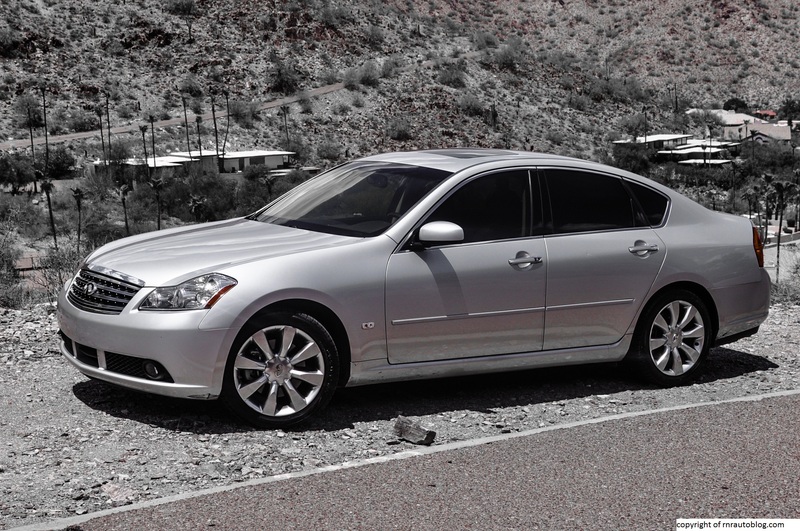 Even though I would buy a 10+ years old BMW 5 Series with a manual, the Infiniti M is still my choice if I were to buy brand new, even if it is an automatic. 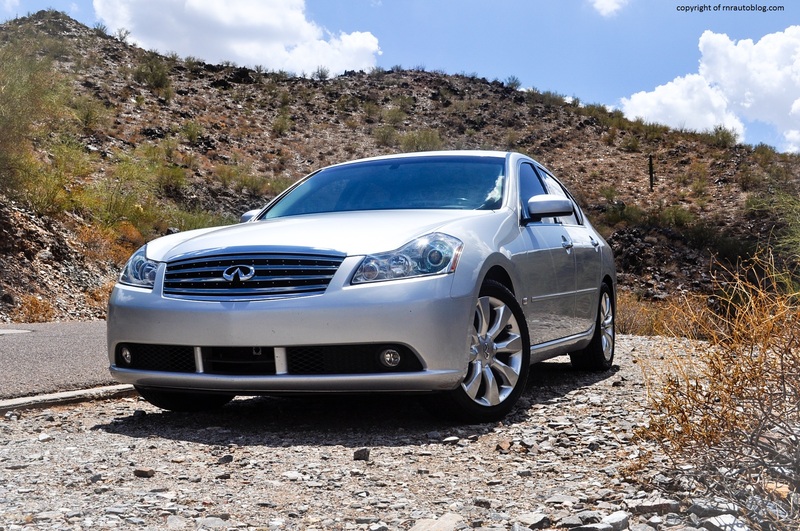 Considering that the luxury sedan market is dominated by accomplished contenders such as the BMW 5 Series, Mercedes-Benz E-Class, and Audi A6, the Infiniti falls short in some key areas. Personally, I am head over heels with this car, but to the typical luxury buyer, it simply just isn’t refined or comfortable enough. I always say that a car’s flaws make it feel more human, and that is true with the M. The M is full of personality and character; it reminds me of a puppy. A puppy will irritate you and be a handful, but you just find it lovable nonetheless. The M is noisy, and the ride is not the smoothest, but the engine and the handling makes up for it. It literally handles like a sports car, and I mean literally considering it is based off a sports car’s chassis. The cabin is roomy with user friendly controls, and the styling isn’t so bad on the eyes either. But when you drive this car, all your criticisms fade away. You become so enamored by the car’s fluidity and sharpness that you forget what why you ever said anything bad about this car at all. I have yet to try the latest Infiniti M…sorry Q70 (I really dislike Infiniti’s new Q nomenclature), but if this generation is any indication, I will probably like it even more. 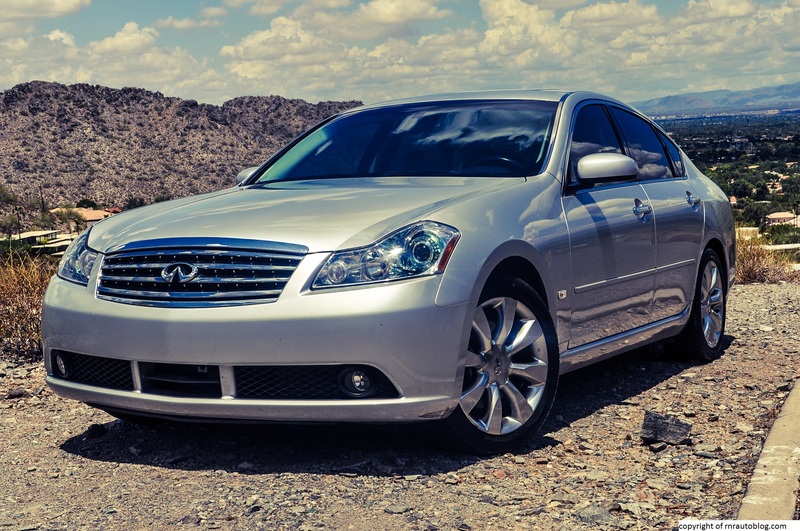 To sum up, the Infiniti M is flawed as a luxury car, but in other ways, it is faultless. Hence a double edged sword.